If you are one of those people who thinks they operate just fine on 6 hours of sleep, you are kidding yourself. You may operate “just fine”, but you aren’t at your best. In one study, researchers found that subjects who slept just six hours a night for two weeks were as impaired as those who had been sleep-deprived for 24 hours straight — the cognitive equivalent of being legally drunk! Besides beer pong, what else do you do better when you are drunk? Bottom line: You’ve got to find some ways to get better sleep. Read on, we got you covered. The quality of sleep you get plays a huge role in your ability to think creatively, problem solve, and make the right decisions. On the other hand, poor sleep can have some severe repercussions. This video by AsapScience highlights some of the cumulative effects of sleep deprivation. A lack of sleep impairs your ability to think, to handle stress, to maintain a healthy immune system and to moderate your emotions. It’s associated with heart disease, hypertension, weight gain, diabetes and a wide range of psychiatric disorders, including depression and anxiety. When you are fatigued, you make horrible decisions. These decisions are both impulsive and short-term, and you actually make more negative life choices that will hurt you over time. This plays a huge role in what you eat, so your best bet to sabotage making healthy nutrition choices is if you are fatigued. Willpower is a muscle which you use throughout the day, and as that begins to drain you begin to make worse decisions. Most people are not sleeping enough. Your body and mind need all the restorative benefits that come during quality sleep in order to serve you best while you are awake. You can eat a perfect diet and take all the right supplements, but if you’re not sleeping well and managing your stress, all bets are off. There is a close relationship between sleep, willpower, and eating. If you sleep less, you’ll have less willpower. With less willpower, you’ll be more likely to binge on bags of double-stuffed oreos. After an oreo binge, you’ll probably get less quality sleep. Sad repeat. We’ve all done it. Artificial light disrupts your circadian rhythm and throws off your sleep. The blue light emitted from cell phones and tablets suppresses melatonin production, which is required for optimal sleep. If you wait until you want to go to sleep to start producing melatonin, you will not get into a deep sleep until your body has produced enough, which could take a couple of hours. Don’t use a computer or any other digital device that gives off any type of light for two hours before going to bed. This isn’t always possible, so the “hack” is to download the f.lux app on your computer or pick up a pair of amber-tinted sunglasses (you can pick some up for $5 on Amazon). Use blackout shades to make your bedroom pitch black. Here is a review of the Top 3 on the market. Your sleep cycle consists of five stages that last 90-minutes each. Stages 1-4 are non-REM, with stage 5 being REM. 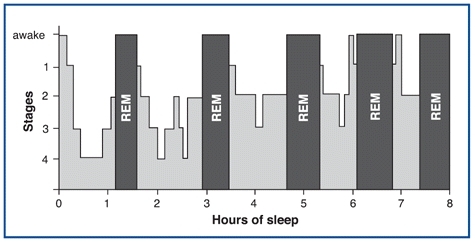 In the early part of the night (11pm – 3am), the majority of those cycles are composed of deep non-REM sleep (stages 3 and 4) and very little REM sleep. In the second half of the night (i.e. 3am – 7am) this balance changes and the 90-minute cycles are comprised of more REM sleep (the stage associated with dreaming), as well as a lighter form of non-REM sleep (stage 2). Set an alarm to trigger you to start your pre-bed ritual. Set a microhabit and some negative reinforcement. Often, just tracking something leads to positive progress. Pick one thing from our list of sleep tracking tools and use it for a week. You’ll quickly start to see patterns that will help you improve your own sleep. Remember, in the end, it’s all personal to you. You need to be a detective, collect data, and figure out what works best for you. Pick one sleep tracking tool and track for a week. Here’s a great step by step walkthrough from QuantXLaFont we tried that helps you track your sleep quality when eating until bedtime vs. not eating after 8pm. 4. Don’t be too full or too hungry, but just right – the Goldilocks of eating before bed. Eating late at night may not cause you to gain weight, but eating until you’re stuffed can cause pain, discomfort, and indigestion any time of day – and that is no recipe for a good night’s sleep. Pick a time to stop eating. Stick to foods that help your body make serotonin and melatonin to get sleepy. Check out Rebecca Scritchfield’s suggestions. Lack of sleep may be holding you back from being the best version of yourself, but it’s not too late. There are some easy fixes you can make starting today. Combine these tips with a proper diet, and there’ll be no stopping you! thereforе I am ցoing tߋ inform her.